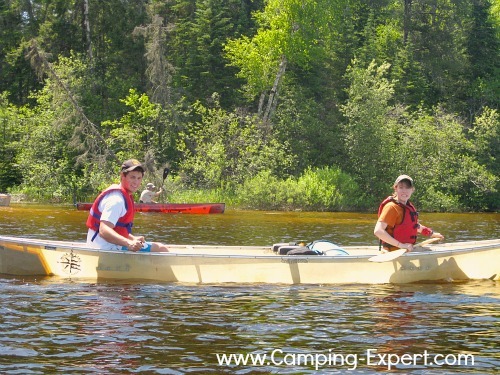 Canoe Camping trips – Only 5 things to plan! Only 5 things to plan! Canoe Camping trips. The only 5 things you need to plan when organizing a canoe trip. Easily explained and organized into 5 main parts of planning so it’s easy to organize. Planning a canoe trip is easier than you think it is. 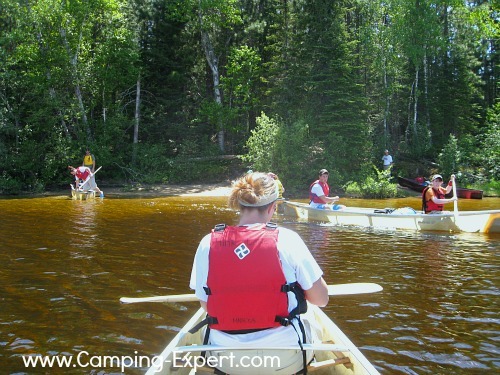 The 5 main things to plan before your canoe camping trips. There are many great places all over the world to canoe and go for canoe camping trips. One of the most well-known flatwater lake canoe areas is the Boundary Waters-Quetico Canoe wilderness area. This is where I’ve done most of my canoeing. In the USA: Boundary Waters, Adirondack (NY), Florida Everglades, Lake Superior, Missippi River (it’s been paddled the WHOLE way! ), Alaska. Canada Canoe Routes has good information for Canoe route ideas in Canada and the USA. The best way to learn camping (in my opinion), is to do it yourself, and what better way than with a guided trip. If you sign up for a guided trip, you don’t need to do the planning, and you can ask your leader everything that they know about tripping. When planning a canoe trip, the route you need to take needs to be planned. Remember, you are only as fast as your slowest canoe. I’ve been in a canoe with a slow paddler, and no matter how hard I paddled, we were ALWAYS behind. The group would stop, and wait, while we paddled to catch up. Then, once we caught up, they would be all rested, and they’d start paddling again. It was exhausting and tiring. So, please keep in mind the ‘weakest link’. Planning the route is something that is easy once you get the hang of it, but much harder when you start and are going to a new location. On average, for a full day of flat water lake paddling with portages and average paddlers, a good day is 20 km per day. If you want a more relaxing trip, plan for fewer km’s (10-15 is good), and if you’re in a very small group of experienced paddlers then you can paddle more, perhaps 30 km/day. If there are fewer portages, then you can paddle further. If it is a river trip, depending on the water speed, you will cover more kilometers easily. Overall, I would plan fewer km’s, since you can finish early, enjoy your site, and go swimming, or play some games. Camping is supposed to be fun! And an escape from your regular life. 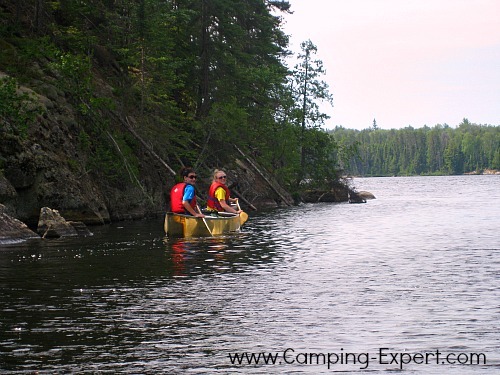 When planning a canoe camping trips, there are several things you need to keep in mind. If you have a group of big eaters (ex. men vs. group of women). This needs to be kept in mind. Also, fresh air and exercise cause people to eat more than they might at an office job. You will need to pack more food than you think you do. More people means more food. The longer the trip, the more food that needs to be purchased as the longer the trip goes, peoples appetite continue to go up, as more calories are expended. This is VERY important. · Dietary restrictions and preferences. So many people have a lot of dietary differences. On my trips, I’ve taken Vegetarians, Celiacs and people with Khrons. Plus MANY picky eaters! I will be adding my e-book soon, which has Tried and tested ’Favourite backpacking recipes book’. The recipes have all been tried and loved on trip. I’ve used my campers as my testers, so you don’t have to be! Check out some free recipe ideas on this page here. Check out my equipment checklist to pack for your canoe trip. This is the EXACT list that I use on all of my trips so that I don’t forget anything. It is very comprehensive. Learn more canoe camping advice: from packing lists, to choosing a canoe.